Do you want to be on television ? I hope this email finds you very well, I found your details on the Wiltshire Parish Councils website. I work for a television production company called Wall to Wall Media and we produce a variety of programmes, including Who Do You Think You Are? (BBC) and Long Lost Family (ITV). We also make BBC2’s living history strand Back in Time; recent series of this include Back in Time for Tea and Back in Time for School. 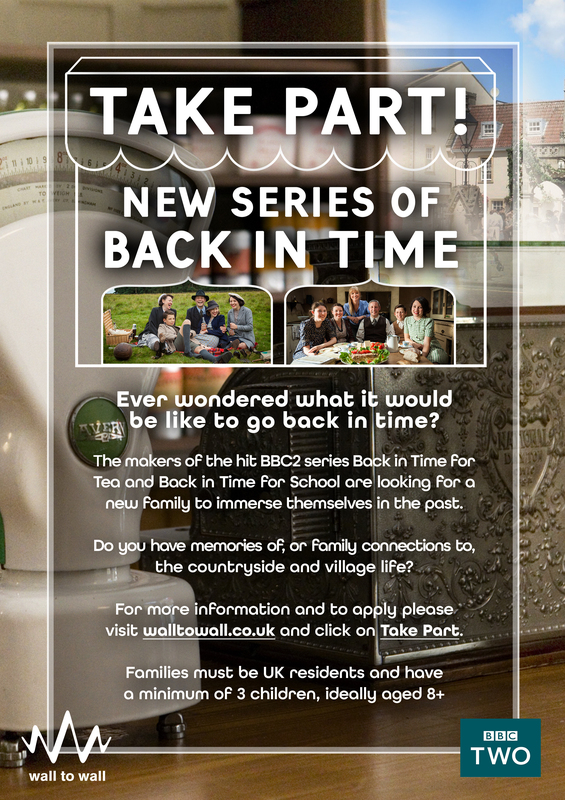 For our new Back in Time series, we are looking for a family to immerse themselves in the past world of rural village life. We’re filming the series in the region over the school summer holidays 2019 and are looking for a new family to take part and go back in time. We’re very keen to get the word out to families in Wiltshire, particularly those with memories of, or connections to, the countryside and village life. I was wondering if it would be possible for you to share our casting information with your Parish Council members and the local community, to see if they’d be interested in applying, or know a local family who might be. It would be great if you could share our casting flyer somehow – perhaps over email, social media, or in a newsletter. Alternatively, I would be more than happy to pop a few casting flyers in the post for you to display in the community on noticeboards or shop fronts, or at your next meeting? I’ve attached our casting flyer for reference which has more information and details for people about how to apply. It would be fantastic to hear from you as to whether this would be possible and please let me know if you have any questions. This entry was posted in Uncategorized on February 24, 2019 by Simon Kearsley.